I write to inform you that the teaching of the Catholic Church on homosexuality,a s described in paragraphs 2357 and 2358 and 2359 of the Catechism of the Catholic Church is rooted in Scripture and based on the Natural Moral Law. It, therefore, shares in God’s revelation to us. Catholics are bound in conscience to believe this teaching. Those who do not cannot consider themselves to be Catholic and ought not to participate in the sacramental life of the Church. Indeed, some might find this is a hard saying by many of Jesus’ teachings were likewise received as such. I urge you to reconsider the position that you expressed in your letter. Your eternal salvation may well depend upon a conversation of heart on this topic. Well this is something that LGBT advocate and amazing straight ally Chris Kluwe of the Minnesota Vikings would just not stand by for. “Tell me, Archbishop, Pope, what purpose does the Church serve attempting to influence the affairs of a secular state? The federal benefits under law currently denied gay couples certainly fall under the realm of Caesar, don’t they? No one is forcing the Catholic Church to marry gay couples if that is not the Church’s wish. You can keep the sanctity of Catholic marriage solely between heterosexual couples if you feel that is what’s required (again though, I caution you on the dangers of presumed infallibility). All we are asking is for you to extend the open hand of tolerance instead of the closed fist of fear and hate. In a short time Chris Kluwe has become an incredibly intelligent, passionate and articulate spokesman for LGBT community. If only the Human Rights Campaign and American politicians would be so forceful and eloquent in answering the Church and standing up for LGBT Equality. We all owe Chris Kluwe a HUGE THANK YOU! 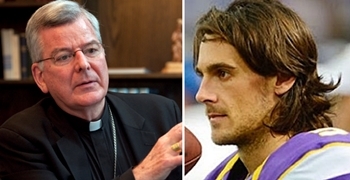 Read Chris Kluwe’s full response .